Imagine the three front speakers of your surround sound system hidden in one sleek, compact enclosure. Imagine it being offered in custom sizes, colors, and wood grains to match any décor. Now imagine it being built by Triad, legendary for their powerful and performance-driven speakers. Dream no more with the OnWall Mini LCR 3.0. Say goodbye to shuffling five different remotes just to watch TV! The ergonomic and user-friendly MX-980 remote control can be custom programmed to control your entire entertainment system. Eye-catching color icons signify your audio or video choices, and it can even turn the entire system on and off with the touch of a single button. The Nuvo Grand Concerto is widely regarded as one of the best values in the multi-room, multi-source audio category. It features a bright OLED display, a glass-smooth touchpad, and can power six rooms of music right out of the box (with options for more rooms as necessary). And while any brand of source component can be plugged into the system, when the Grand Concerto is used with other Nuvo brand sources (like the XM/FM dual tuner or iPod Nuvo dock), you get complete station, artist, and play list info. right on each keypad display. This flagship receiver has seven channels of high-power speaker amplification, passes the latest high resolution HDMI 1.3a audio/video information, and can power a second independent zone of music. It is XM satellite radio and iPod ready, and features Yamaha’s YPOA auto-room EQ and calibration. And when using a LAN connection, it can also act as a network receiver, so that you can play your favorite internet radio stations, MP3’s, WMA’s, and WAV files. Protect your investment with the most bullet-proof surge protection in the industry! 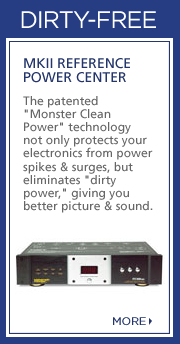 The patented “Monster Clean Power” technology not only protects your sensitive electronics from damaging power spikes and surges, but eliminates the effects of “dirty power,” giving you better picture and sound. Plus it is the equivalent to buying insurance for your electronics. If a Monster Power device ever fails to protect your equipment, Monster will replace the affected items free of charge. iPods are hot, and this docking station from Elan allows you to listen to your iPod from anywhere in your home. Not only that, but when used in conjunction with Elan VIA! Touch panels, your entire database of favorite artists, videos, and play lists can be displayed and controlled remotely in each room. Now iPod truly is everywhere.